With dedicated business and hands-on backgrounds in site preparation and road grading work, Harry MacLauchlan and Robert Dawson formed a business partnership in 1969. Their first major project - provide boats and supplies to surveyors marking a proposed link between Prince Edward Island and New Brunswick. After completing the contract, MacLauchlan and Dawson turned their focus back to grading and preparation projects, though their skills as a business had been expanded by the experience. This was a theme that would recur time and again for the young company. As the scope of experience grew, so did the size of the company itself. In 1973, Blair MacLauchlan, Harry's nephew, was welcomed to the company as Project Engineer. Two years later, Blair purchased Robert Dawson's share of the company, and with his uncle, incorporated Island Coastal Services Ltd. Today, Blair is General Manager and President. Since its beginnings, Island Coastal Services Ltd. has been behind the site preparation of countless schools, provincial office buildings, and hospitals on Prince Edwards Island, truly laying the groundwork for Island communities. Awarded the contract for the operation and maintenance of Parks Canada's Green Gables Golf Course, Island Coastal Services Ltd. again expanded its expertise. This was followed by the company's construction and development of PEI's Links at Crowbush Cove, voted "Best New Golf Course in Canada" by Golf Digest Magazine in 1994. 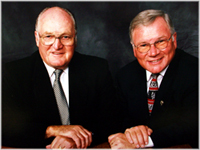 Though co-founder Harry MacLauchlan passed away on March 27, 2002, he has left Island Coastal Services Ltd. a legacy of superb business practices, provincial improvements, and an appreciation and respect for clients, Islanders, and the people who turn those business practices into reality. As former lieutenant-governor of PEI Marion Reid said of MacLauchlan, "He was a very successful man and a very generous one. He worked extremely hard at everything he did and gave his all to his community." It's this dedication to community, employees, and clients that is the cornerstone of Island Coastal Services Ltd.
From a startup business with only a few employees and scant equipment, to a major company with 250 employees in peak season and 200 pieces of equipment, Island Coastal Services Ltd. continues to develop Prince Edward Island. Blair MacLauchlan, in an interview with industry publication Heavy Construction News said, "I think that a big part of the success of Island Coastal can be found in its people. We try not only to meet the customer's specifications, but we will suggest improvements and try to do the job even better if we can. Everyone here is 'hands on' when it comes to a customer's project."